One of the first things you can do for a lawn in the spring is thatch control. Thinning out the thatch in the spring clears out old, dead grass and other organic matter that has built up over time but has not broken down. De-thatching will open up the lawn surface allowing for improved nutrient and water uptake as well as severing up stolons and rhizomes which encourages new growth. The renewed growth and warming temperatures of spring provide the ideal setting to perform this procedure. A mid-priced de-thatcher would pay for itself over time since most lawns would benefit and thrive from even a light de-thatching almost every year. How Do I De-thatch my lawn? First, determine if your lawn has an excessive amount of thatch. A thatch layer thicker than a half inch would warrant a de-thatching. De-thatching may not be necessary if a lawn has a thatch layer less than 1/2 an inch, however, even a moderate amount of thatch would reap the benefits from a light de-thatching. If it is determined that a lawn needs de-thatching, you can hire a lawn care company to perform the task, or do it yourself with your own equipment or a rental. De-thatching units are available in many forms but are either powered and non-powered. • A powered unit can be tractor mounted or a walk behind and gets it’s power from an engine, a PTO, or hydraulically. 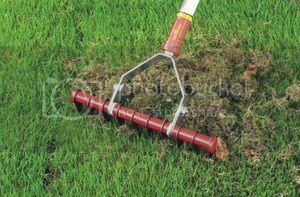 It either uses a series of vertical discs to cut the rhizomes and stolons and bring the thatch to the surface, or a series of spring loaded fingers to achieve similar results. Powered de-thatching is sometimes referred to as vertical mowing, verti-cutting or power raking. • A non-powered de-thatching unit is more reasonably priced and is usually dragged behind a lawn tractor or operated manually. A pull behind unit tears rhizomes and stolons, and pulls up thatch with a series of wire fingers that scratch the surface to various depths, depending on the weight applied to it. De-thatching manually is hard work and less effective but is nothing more than vigorously raking the lawn with a hard tooth rake. De-thatching a lawn in the spring helps it “wake up” by removing old, dead material, cutting old rhizomes and stolons (which encourages new growth), and thinning the thatch layer to allow better access for nutrients and water to penetrate the surface. Whether your lawn has a thatch problem and needs a deep de-thatching, or it just a light scratching, spring is the time do it for noticeable results in the summer. This entry was posted on Sunday, March 31st, 2013	at 9:00 am	. You can follow any responses to this entry through the RSS 2.0	feed. Both comments and pings are currently closed.